An eminent economist, Professor Pandit received his doctoral degree from the University of Pennsylvania, Philadelphia, working with Professor Lawrence Klein, Nobel Laureate in Economics. He also taught at reputed universities in the United States and United Kingdom as a visiting Professor. In 1999 he was appointed by the United Nations, New York as Chairman of the Committee on Policy Modelling for Less Developed Countries. He was elected as President of The Indian Econometric Society for 2001-02. He was also Advisor to the Ministry of Planning, Government of Sri Lanka, during 1989-90. Recipient of the University Grants Commission Swami Pranavananda Saraswati National Award in 2004, Professor Pandit has served at the Delhi School of Economics for many years in different capacities including Head, Department of Economics, and Director, Centre for Development Economics. In August 2008 Bhagawan Baba blessed him to serve as the Eighth Vice Chancellor of the Sri Sathya Sai Institute of Higher Learning. Prior to this, since 2001 he had served to set up the Department of Economics in the same university. He was also one of the four teachers felicitated by Bhagawan Baba in June 2006. Presented below is an edited transcript of the talk delivered by him in the 'Summer Course in Indian Culture and Spirituality' conducted by Sri Sathya Sai Institute of Higher Learning on June 10-12, 2011. My loving pranams at the lotus feet of our Beloved Lord, Bhagawan Sri Sathya Sai Baba with humility. Respected elders, special invitees, distinguished members of the faculty and most dear students – Sairam to you all. This is indeed a great event for the Institute not only because teachers and students of all campuses have got together right at the start of the new academic year; not merely because vital matters regarding education are being discussed for future guidance; but much more because we are able to assure ourselves that the Revered Founder Chancellor of the Institute is here with us and we are determined to rededicate ourselves to His Divine Mission of which education is the corner stone. Bhagawan has told us on many occasions that His educational institutions have been established to produce role models for tomorrow’s world and for this reason the world would be watching us. To this I would like to add, with conviction, that today He Himself is watching us. Let us be aware of this every moment. More commonly, in today’s world education needs to be seen as consisting of three components, namely, Information, Knowledge and Wisdom, sequentially each one leading to the next so that we ultimately end up with wisdom. While knowledge backed by information developed human skills and capabilities to achieve many things in the best way possible, it is wisdom that guided one to decide the priorities. Ultimately, every thing one undertook had to be purposeful not only to oneself but more so to the society one lived in. Enlightened self-interest could be the starting point but one had to rise well above this. The last few decades have witnessed a phenomenal development in the acquisition of both information as well as knowledge, of incredible dimensions, so to say all across the world. Unfortunately, however this has been accompanied by two other developments. On the one hand, for many reasons which we need not take up now, large chunks of education have become a thriving business and thus been more or less corporatised. On top of this has been the second development spread over a longer span but reached a critical limit in recent decades. I am talking of the fact that wisdom has ceased to be a serious component of the agenda for education. It is even worse. As someone has said wisdom and virtue have got replaced by folly and vice. make sure that you are not caught by the law.” That is Education today. It teaches students the elegant ways in which the prevailing systems can be manipulated to their advantage. We see the impact of this system of education always, unavoidably from the hour we get up and start the day. The newspaper is full of stories relating to crime at all levels, involving children, women, social groups and communities. Instead of helping others the mind is focused on eliminating all obstacles which appear, rightly or wrongly, between me and my selfish objectives. Corruption has become the order of the day. There is a strong nexus between politics, bureaucracy and the corporate sector, all against the poor citizen and their basic rights and needs. Highly educated men and women with brilliant capabilities are involved in different ways at several levels. Commitment to the eleventh commandment is total. How and why the world had to suffer the severe global recession in 2008 is the most painful example of this phenomenon. The consequent suffering is still not over. Millions have not yet found employment. Enormous number of good people have lost their lifelong savings for old age. Millions of households again are left with no access to health care and education for children even in countries we consider rich. This is not the occasion to get further into details. I would only like to make one observation. The benevolent Lord of the universe has endowed humanity with everything it needs: precious natural resources, a head full of intellect able to think and discriminate, and above all, a heart full of compassion. All that needs to be done is to use these gifts of God effectively for ourselves and others. In today’s world, unlike two centuries ago even mindless consumerism does not work. While private vices abound, public benefits are absent. Obviously, new complexities are at work. These have to be understood before solutions can be made effective. True education must help us to deal with massive unemployment and unprecedented inequalities faced all over the world. folly, there can be no certainty for survival. - Bertrand Russel (1960), Impact of Science on Society. good of the world. An education devoid of this is worthless. room for harmful thoughts or deeds. The public discourse on topics including education in today’s world which runs in terms of ethics is most welcome, even though it is not as widespread as it should be. The difficulty nevertheless, lies in the fact that ethics is not adequate because of its contextual nature. What was taken to be right yesterday is not accepted so today; and, what is taken to be ethically right at place A is not taken to be so at place B. We need to focus on the spiritual foundations which go beyond time and space. This is dharma or, what may be translated, as best as we can, as Righteousness. While this is one part of the foundation the second part consists of Sathya or Truth. Once again, the translation is as best as we can think of. At this level one must hasten to underline that there is only one Sathya and that is God. But this brings us face to face with a forceful class of people and their strongly held views which may be taken up briefly as follows. With respect to human behaviour the discussion usually gets focused on what is referred to as Rationality. At other occasions when philosophical issues are under review, attention hovers around Reason. Scientists typically insist on physical verifiability of the assertions made. References to God and more generally to spirituality typically provoke a strong response from this class of thinkers and one has to be prepared for a well reasoned and meaningful response. Without going into an elaborate discussion I like to make some observations that may be helpful in such situations. My objective is mainly to highlight the problems with this set of terms and how these are often mistakenly used on most occasions coupled with a narrow view of not only human life but also of the environment within which one lives. The term rationality is usually used in behavioural sciences like economics, sociology and political science. While it is widely used it is seldom easy to define. In most situations rationality simply boils down to the pursuit of self-interest if not pure selfishness coupled with a consistent process of thinking and decision making. At the root is a highly restrictive view of not only life but also of the society one lives in. In a rigorous critique of this notion of rationality, the Nobel Laureate, Professor Amartya Sen warns us against becoming Rational Fools. Even those not totally against self-interest have raised serious questions. Here I must mention another Nobel Laureate, Professor Herbert Simon who talks about Bounded Rationality as being closer to and more meaningful for human behaviour. This qualified notion of rationality takes into account all factors, including moral considerations within which decisions have to be made in every context. cannot tell us where to go; at best it can tell us how to get there. Scientists are typically focused on the manifest creation because of which they get more or less wedded to the principle of physical verifiability for whatever they accept as reality. This induces them to question aspects of spirituality and particularly to faith in God as they consider this to be beyond physical verification and usual intellectual reasoning. There are some basic problems with this view. First of all, most of us including sophisticated intellectuals do accept many scientific propositions which we never will be able to verify. This is because we trust great scientists who have undertaken the complicated verification and sometimes even their deep intuitions. Can we not apply the same principle to great saints and sages who have had great enlightenment and a deep vision not possible for us, the ordinary mortals? Second, there is the fundamental question namely, “What is God?” Spirituality gives us remarkable freedom to choose. Scriptures declare, “Thou art That” meaning God. Bhagawan has repeatedly told us “Love is God and God is Love”. How can it be simpler than that? "Journey Into Valmiki’s Ramayana, Part-2" by Prof. G. Venkataraman published by Media Division, Sri Sathya Sai Sadhana Trust, Prasanthi Nilayam. We may not think of it most of the time but subconsciously we are always in search of happiness in all our endeavours. However we have to be clear about two aspects of this phenomenon and true education must take care of these. On the one hand let us make sure that we are not after temporary pleasures which appear to make us happy for a short while. Unfortunately this does happen quite often. Second and a closely related question is about what we seek happiness from. These are indeed two sides of the same coin and education must take care of both of these. need and not waste anything. Share your excess food with others. Want is a growing giant whom the coat of Have was never able to cover. 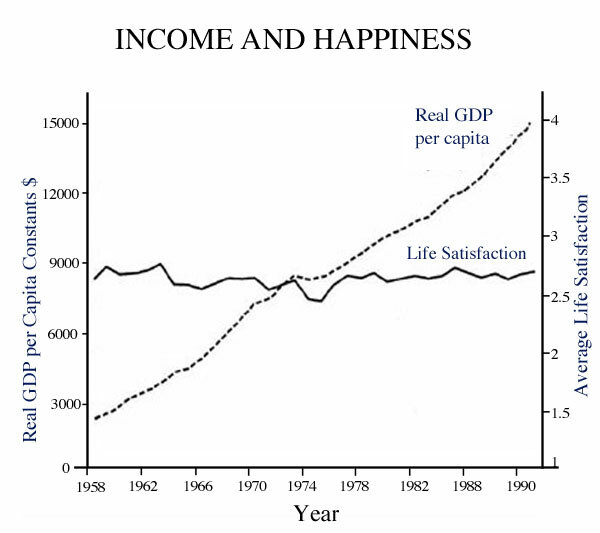 Royal Economic Society, July 2001, Vol.111, 465-484. The observation is further documented by the following diagram based on hard data from Japan. Clearly, durable and true happiness has to be sought from something else; not just from wealth or income. If this is the case why pursue education for money. Thus, let education be for life and not mere living, as Bhagawan has been telling us. That gives us happiness. More than a century back the renowned philosopher, John Stuart Mill had clearly diagnosed the basic source of ailment of human society and true education as the cure. Selfishness is the principal cause which makes life unsatisfactory. devoid of feeling for others. Education must rectify this. between God and all the beings. Finally, let us recall Bhagawan’s message for all of us. We have rights which are excessively discussed in today’s world but these must come out of the responsibilities we carry. That the two must go together is ingrained in India’s ancient culture. Let us recall how our beloved Lord puts it as follows. Thank you and Sai Ram.